Some call them mountains, others the Highlands, while some will tell you they are merely hills. Whichever you prefer to know them as a stroll to the top of Robert’s Mountain will surely reward you with a summit like view. Just outside the quaint little friendly village of Pleasant Bay a trail leads up through a country field past old country homes – paint chips peel from their weathered wooden siding, wind howls off the Bay of St Lawrence while smoke rises from red bricked chimney’s. 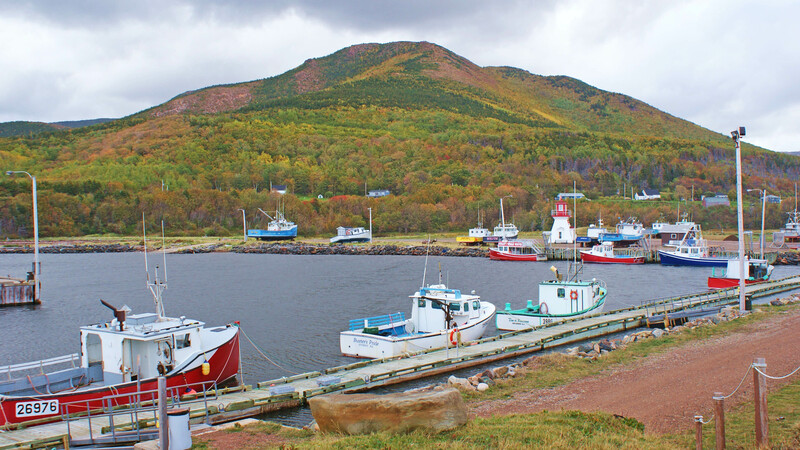 Robert’s Mountain overlooks Pleasant Bay Harbour. The trail quickly climbs through a mixed forest of birch, spruce and maple – but mostly black spruce, Nova Scotia’s official tree. After you arrive to the small clearing with a small wooden building the trail continues up into the forest to your left – a steady climbs awaits you. The trail rises steeply like an escalator, mind you there are no stairs or free rides here for that matter. This portion of the trail does not last long and once above tree line the scenery opens up before you – ocean views, tree clad highlands rolling down the valley and whales playing in the waters below. You will notice the winding road of the Cabot Trail snaking it’s way down McKenzie Mountain into the valley and the town of Pleasant Bay. North Mountain and the Cabot Trail running along it’s base. Climbing the mountain from here becomes quite the experience with it’s obvious exposed pink stone that forms this highland beauty. This pink quartzite rock is mostly found at sea level here in Cape Breton but here the rock dominates the barren summit which offers a 360 degree view of some of the islands greatest scenery. To make the most of this inspiring landscape I would recommend you tackle this hike during the fall foliage which usually begins the first part of October and lasts roughly 3-4 weeks. At this time the highlands change from green to a palate of colors – orange, yellows and various shades of red paint the land, truly one of natures finest masterpieces.